Modern life is so complicated and full of things that need to get done, it can feel overwhelming at times. Not so much because of the existence of the to-do list, which is simply an unavoidable fact. What causes to-do anxiety is the feeling that there’s just too much on the list to ever get it all done. And, you know what? There probably is. That’s not necessarily a bad thing, however. Much of the stuff that ends up on the to-do list wouldn’t be a calamity if it never got done. Chances are, nobody would even pay enough attention to notice. It may feel like it’s been hanging around embarrassingly on the list forever; but the fact is, nobody else cares because it’s not a big deal and never was. So I decided to write a “who needs to do it list” where all the annoying stuff that has been buzzing around on my to-do list for years can go take a nice long nap. Preferably on the ancient couch in my living room that is #1 on the list. When I say ancient, I mean it has been around since my two college-graduate kids were little preschoolers gleefully jumping on it when I wasn’t looking. After they inevitably broke something and left a sagging spot, my daughter (who was full of good practical ideas even as a child) helpfully suggested putting an old pillow under the cushion. 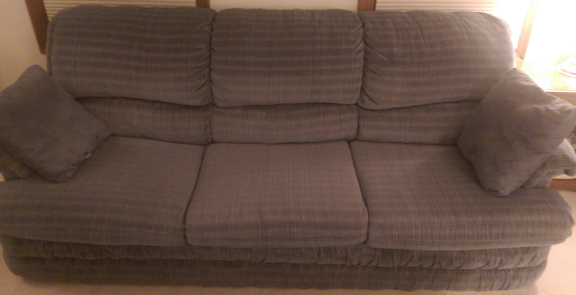 Replacing the couch was something I wanted to do for a very long time. But, even though we are not paying tuition anymore, it still hasn’t gotten done. My husband doesn’t seem to have much interest in looking at furniture—like many guys, he’d rather buy gadgets and do fun stuff. And I started thinking, well, what difference does it really make? Who needs to do it? After all, my husband is the one who sits on the cushion with the old pillow underneath; my side of the couch is not as broken down. If it doesn’t bother him enough to want a new couch, then why should I care? I was going to finish this post by listing a few more “who needs to do it” things; but after writing about the couch, while sitting on it with a notepad and pen, I felt like I’d really rather take a nap instead! And of course, the list itself is another “who needs to do it” because it wouldn’t matter one iota if I never wrote it. Ditto on finishing the blog post at a particular time or writing a certain number of words; it’s just for fun and to reflect on whatever’s on my mind. No biggie! Good idea about that list! I know I have some things to put on it 🙂 Yeah take the nap, naps are always nice! Wisdom from the subconscious mind!